You can find complete source code of this blog post in my Github repository. There are few things to note in above code. aura:dependency – This tag indicates, which component can be used to show as part of Lightning Out. We are using standard Lightning component forceChatter:feed, which will show a logged in user’s chatter feed. Next step is to create a SSL certificate which can be used in Node.js application. 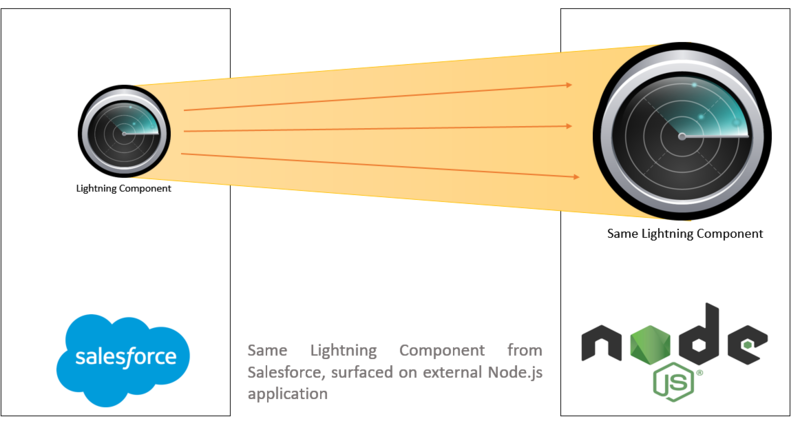 This step is important, as Lightning component would be rejected by Same-origin policy and we can fix it by adding our Node.js application’s URL in Salesforce CORS (Cross-Origin Resource Sharing) setting. Download OpenSSL from here and run below commands to create self signed certificate. Above command will create two files – server.crt and key.pem which needs to be used in Node.js application. I would be using almost same code as of my previous post where we built Simple Salesforce IDE using Tooling API. However there are three below major changes in Node.js application. Below method is added in Server.js file which enables Cross Origin Resource Sharing (CORS). Don’t feel like you are lost in ocean from above steps 😉 , complete source code can be found at my Github repository here. There are many ways to authenticate Salesforce from your website. Most secure and recommended way is to use OAuth. To use OAuth, we need to create a Connected App in Salesforce which contains various settings like what can be accessed by external application and after authentication where to redirect Salesforce login etc. If you are creating Connected app first time in Salesforce, then please visit this URL for detailed information. Make sure that callback URL in your connected app is https://localhost:8081/oauthcallback.html. Once Connected app is created, copy consumer key and update OAuth.js file with this key. This step is to add our Node.js application in CORS setting of Salesforce. It allows, our Node.js application to use Salesforce resources like Javasript and CSS. So save https://localhost:8081 in CORS setting of Salesforce. If you are at this stage that means you already have Lightning out enabled Lightning application, connected app and Node.js application. Assuming, you have downloaded source code from github repository, run below commands in downloaded directory. If everything works fine, you will see message on console saying Server listening for HTTPS connections on port 8081. Navigate to https://localhost:8081/ and you will see page asking to login. After successful login, below page would be displayed, which is nothing but Lightning Component running in Node.js using Lightning Out. Try to run command in folder where openssl is extracted / installed OR add openssl bin folder path in environment variable. I want to redirect the user from e-commerce website to salesforce Lightning component. Can you please let me know on how can I approach on this? I am not aware of Node.js, so without using Node.js is it possible? Please suggest. Hi Jitendra, any example of the other way around? how to embed an external web app (HTML5, etc) within a Lightning page? I was pointed to Salesforce Canvas feature. Hi Jitendra, useful post. Can you give examples of how to embed an external Web app (HTML5, …) within a Ligthning page? I was pointed to Canvas, but never use it before. Thanks! I am seeing error with inline.js not found – 404. This happens after the .app?aura… call and the component is not shown. I set everything up on a clean Mac (certs, connected app etc). At one point I was able to change all references to port 3000, which avoided the error when starting ‘npm start’ or even ‘node server.js’. The server would start and the web page would display but never show a component. Thanks for all your great examples so far. I have created 3 lightning component and I am calling the components from 3 different html pages. I have added the html pages to the local host I created. But I am receiving the following error on the browser console “No Access-Control-Allow-Origin” for all the Static Resource scripts that I am trying to load using ltng:require. I have added the local host address to CORS, but yet I am receiving this error. Can you please help me out. Thank you. Hello Mukherjee were you able to solve this error i am also getting the same. Hi Jitendra, thank you for very useful content! Just wondering if have you seen this implemented and working for iOS devices using Safari browser with “Prevent cross-sete tracking” option enabled! I have implemented the same. its working perfect… Thanks a lot for such a nice step by step guidelines. But the only issue which i am facing after Oauth from Integration user in Portal. When you will open salesforce in next tab same browser. 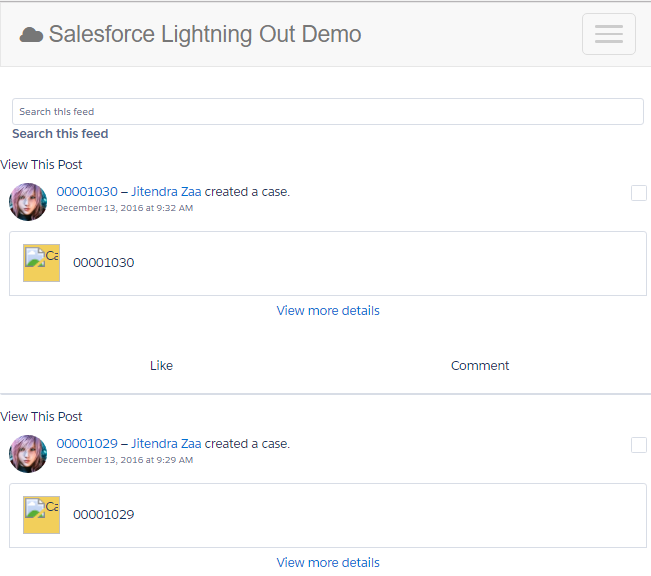 your salesforce Existing profile will be overridden by the Integration user which you can see in lightning mode only. due to session and cookies. Any Help will be really appreciated… Thanks a lot in advance.